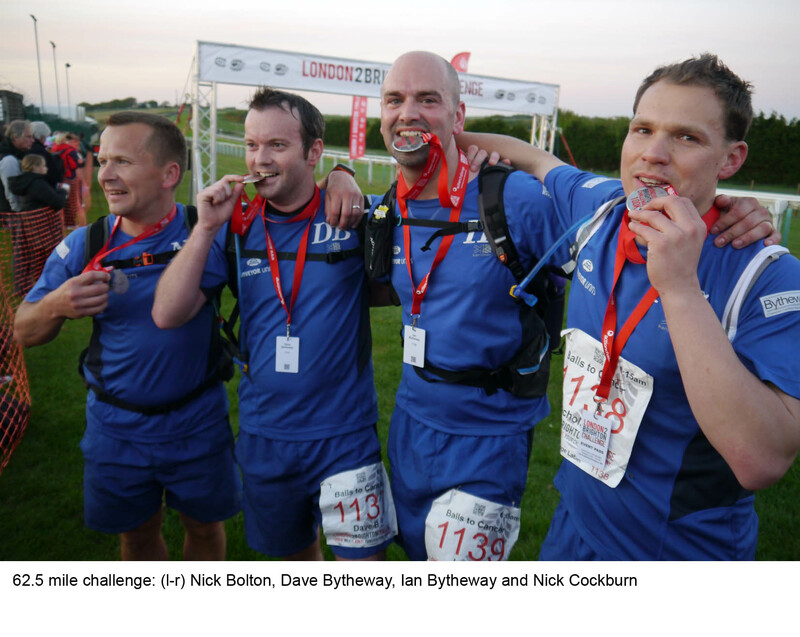 Dave Bytheway, Ian Bytheway, Nick Cockburn and Nigel Bolton ran 62.5 miles from Richmond Park in London to Brighton Racecourse in under 15 hours. The intrepid quartet, who came up with the fundraising idea over a few pints in the local, smashed their fundraising target by over £1500 and will now buy Balls to Cancer its first pop-up screening clinic. This investment will be taken to events across the UK to provide a discreet place for men to be checked out for all forms of cancer in the hope that early detection will save lives. “When we dreamed up this challenge none of us thought we’d actually hit the 15 hour mark, let alone beat it by nearly 15 minutes…it’s a great feeling, especially when we saw how much we had eventually raised,” explained Dave, who is a director at Bytheway Accountants in Sedgley. Team Running on Empty spent six months getting ready for the London to Brighton Challenge. This involved a 500-mile training programme, which included two ultra races, 4 marathons, 2 half marathons and the infamous Groundhog Marathon – 105 laps of Telford Athletic Stadium. The hard work paid off, with the Black Country runners finishing in the top 150, out of a total of 1900 runners, joggers and walkers. Nigel Bolton, a firefighter at Walsall Fire Station, picked up the story: “All of this has only been made possible thanks to the backing of some great local companies that have helped us buy training equipment and got our fundraising efforts off to a flying start. Team Running on Empty is planning its next big challenge, with early talks focusing on a 100-mile run next year. Donations to Balls to Cancer are still welcome by visiting www.justgiving.com/londonbrighton2013.